We offer free online orientations for all visitors who would like to learn more about our online training programs. You will have the opportunity to participate in a live-orientation environment and meet staff members who will be able to answer any questions you may have. Our online orientation familiarizes and acquaints prospective students with how our learning management system operates, important policies, admission, expectations, and the range of services and programs available. 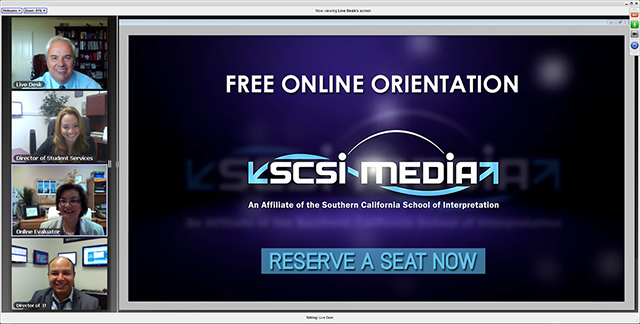 Please sign-up for our next online orientation. We will remind you by e-mail a few days before the orientation date. Remember, this is a free orientation, each orientation is limited to a maximum of 20 students. We offer orientations on different dates and times, if one session is full, you always have the option to sign-up for the next scheduled orientation. On an average basis, certified Federal Interpreters earn between $388 per day.